To become parent is responsibility in itself if you are ready to accept this responsibility or already accepted this responsibility you should do following for your child for his/her bright future. Revisit your life insurance cover:- You should relook in to your life insurance cover. Prior to becoming father/mother your responsibility was less monthly expense was less. With addition to family member your monthly expense and your need increases hence, you should increase your life insurance cover. This is most important point. Open a bank account in your child’s name:- Another thing which you have to do is open bank account on your child name and start saving money for your child. This account will be on name of minor and you/your spouse act as guardian.Please make practice to save 1000-2000 Rs/- per month which will grow in to big amount and can be used for other investment for your child. Most of child get good amount of gift in terms of money please deposit that amount on your child name only. Open a PPF/RD account:- PPF investment is one of the best investment, you can earn fix return on compounded amount for long term , it is safe investment and give you advantage of tax saving also. If you have not open this account please open this account which will provide 8.5 % return YOY. Another option to PPF account is Recurring deposit most of bank provide this facility interest rate varies from bank to bank. 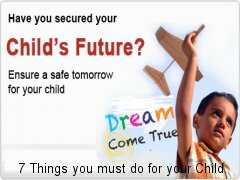 Plan for child’s Education:- Education now a day is need for every child and it is getting costlier year on year. You have to decide that your child may select engineering / medical as career option and in order to meet that future expense for his/her study you must plan target amount required and start investing for that.You can take help of financial advisor for this. Plan for child’s marriage:- Another thing which is requires once your child grow up is responsibility of his/her marriage. Considering average cost of marriage today one should plan forward for the cost of marriage as marriage is certain thing which defiantly goanna happen one day. Redefine your Financial Goals:- Once you are father/ mother you have to relook / redefine your financial goal as addition of one member in to family keeping incoming income same outflow money every month goanna increase not only that additional goal will be added in your financial portfolio.Hence you need to redefine your financial goals. Teach them value for money & power of saving:- Most important thing which you need to do teach your child is power of saving money You can teach them by various method most appropriate is provide them piggy bank and explain them to save every month some money from pocket money.